First Issue Special #1 Page 8 Original Art. 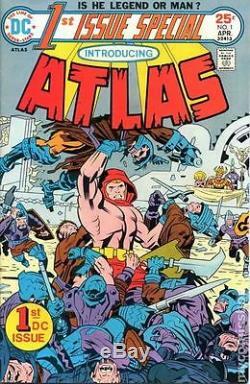 This one being the First Appearance of "ATLAS" from the Premiere Issue of "1st Issue Special" series. This is classic Kirby and true comic history with the original Kirby art matching closely with the Kirby Cover Action. Pencils by Jack King Kirby with inks by D.
Bruce Berry published way back in 1975 with a cover price of 25 cents. The power of Atlas is on full display in this Jack Kirby action page from the premiere issue of the 1st Issue Special run. When Kirby moved from Marvel to DC at the start of the 1970s, he was set free. Able to draw the way he liked and write the stories he wanted to tell, he set off on turning out his "Fourth World" saga, telling the cosmosning tale of modern day gods. Kirby's take on the Greek titan Atlas was very much in keeping with this motif and this is a high quality example of the "King's" work from this time period, with bold figuration and otherworldly power filling the page. In many ways, this period is Kirby at his purest and more Kirby collectors are making this era a major focus of their collections. As a result, these pieces are much less likely to be found out on the market than they were a few years ago. This art has an image area of approximately 10 x 15 inches and is in excellent condition. The winner will own a piece of Kirby key issue history and be very pleased with this one as I have been. The art is in excellent condition measuring 10 x 15 inches Image area. Although, it has risen in value since then and will continue to do so. 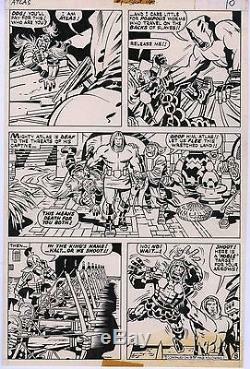 The item "Jack Kirby 1st Issue Special #1 Original Art Page 8 First ATLAS Appearance" is in sale since Tuesday, November 01, 2016. This item is in the category "Collectibles\Comics\Original Comic Art\Covers". The seller is "gemcomics" and is located in Mattoon, Illinois. This item can be shipped worldwide.